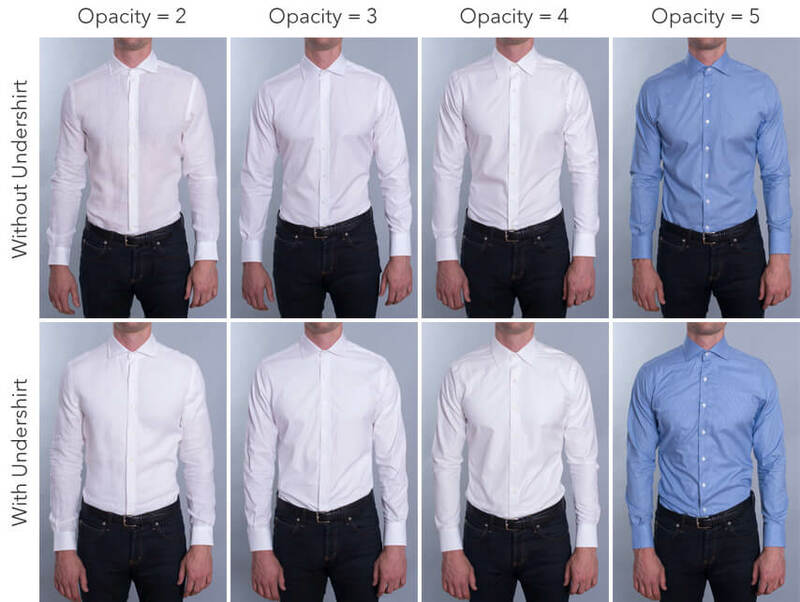 Have you ever wondered what the difference is between a cheap dress shirt and an expensive one? What warrants a dress shirt’s nearly $100 price tag? And if one costs so much, then how can the other brand sell a shirt for the price of two inflatable rubber chicken? 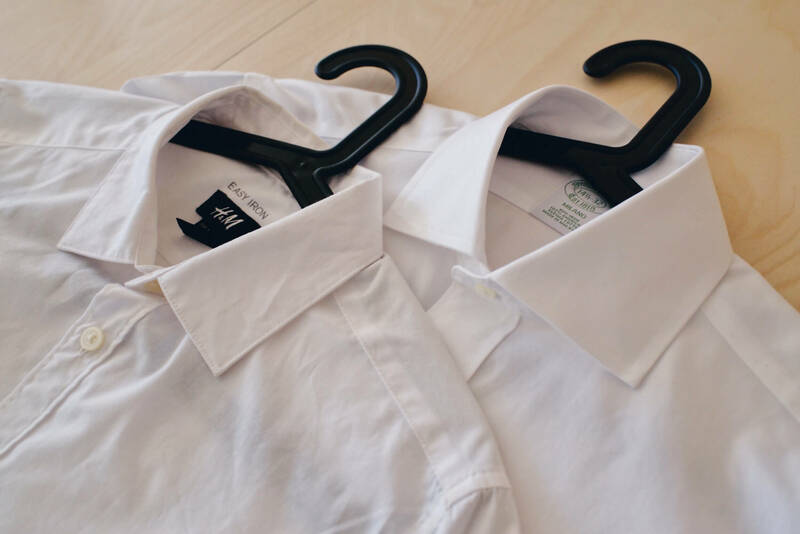 In this case study, we’re comparing these two products: the H&M Easy-iron Slim Fit Shirt (retail price $14.99) and the Brooks Brothers Non-Iron Milano Fit Spread Collar Dress Shirt (retail price $92). More often than not, you can find Brooks Brothers shirts on sale for much less than the retail $92 price. If you purchase 4 shirts, you can usually get each shirt for about $50. If you wear dress shirts every day at work and you know a size that fits you well, it only makes sense to buy 4 or more. As for the H&M shirt, it costs retail $14.99. There are occasionally sales as well, but I’m not privy to exactly when. I’ve purchased both of these shirts with my own money. The H&M shirt was purchased in slim fit size Small and the Brooks Brothers in neck size 14.5 and sleeve length 32 with the Milano Fit. At the end of the article, I’ll share which one I prefer (I think you can probably guess that already) and which one I feel is the best value. You’ll notice the first difference between the two shirts before you even purchase them. H&M follows the XS through XXL sizing system, whereas Brooks Brothers sells shirts by neck size and sleeve length. For first timers (myself included) it’ll take a tape measure to get the fit right. 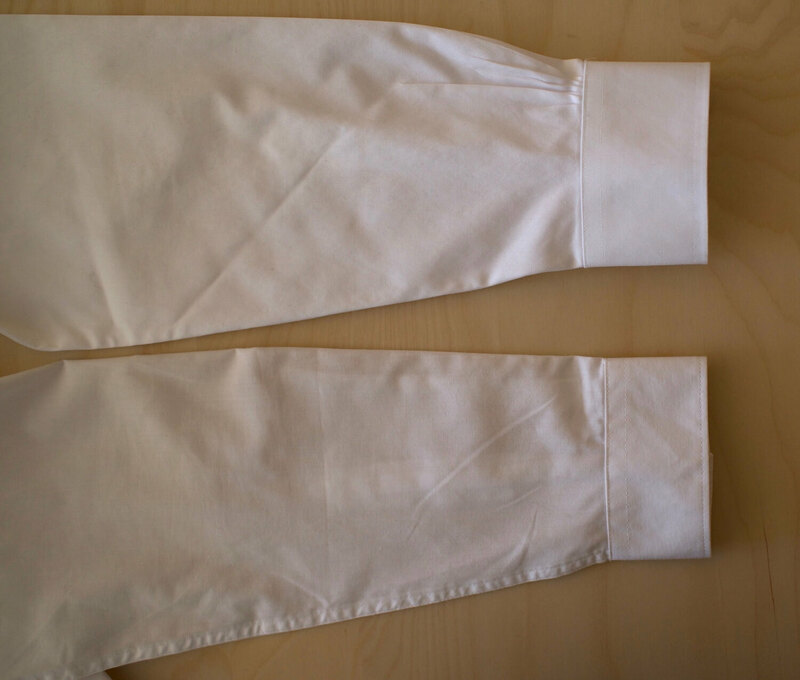 The neck/sleeve sizing system allows you to get a more accurate fit. H&M’s fit is more contemporary, and their slim fit is slimmer than Brooks Brothers’ Milano Fit (formerly known as Extra-Slim Fit), which is Brooks Brothers’ slimmest fit. Both shirts have a poplin weave. 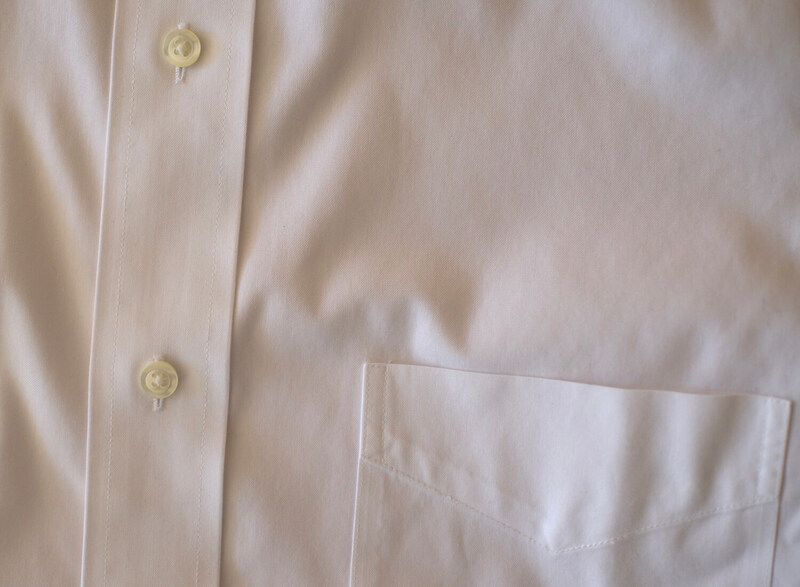 The Brooks Brothers shirt’s material, however, is thicker and less translucent. The Brooks Brothers material all round seems to be a much brighter, vibrant white. With the H&M shirt, you can see the outline of an undershirt, even if it’s white. I haven’t worn the H&M shirt that often, but it looks like its almost pilling on the shoulder area. The H&M shirt would have an opacity of 2 on the scale above, whereas the Brooks Brothers shirt would be somewhere between a 3 and a 4. I will note that not all Brooks Brothers shirts are made from the same material. While purchasing the Milano Fit Spread Collar Dress Shirt, I also purchased another Milano Fit dress shirt with French cuffs. 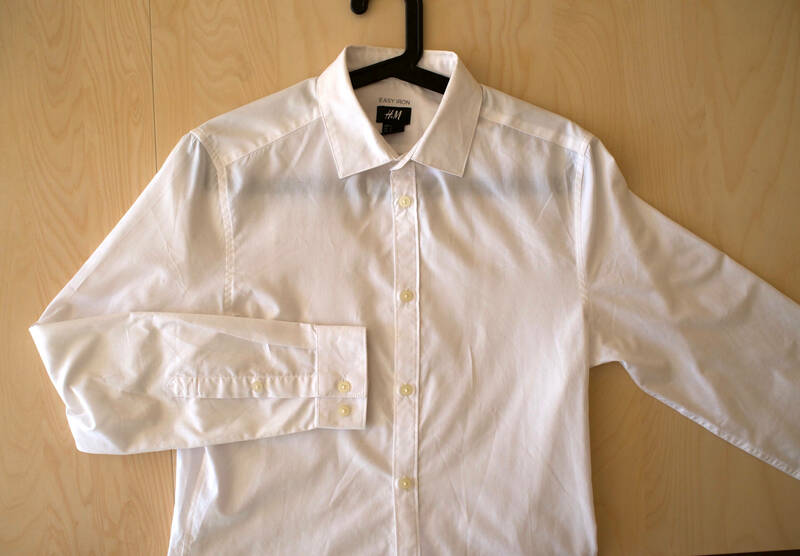 I was surprised to see that material shirt with French cuffs was much thinner, and just felt cheaper – it would be a 2 on the opacity scale above. The H&M slim fit shirt has thin plastic collar stays, but the collar still feels a bit floppy. The Brooks Brothers also has plastic collar stays, however the collar is larger and feels much more substantial and is very crisp. Both shirts have spread collars, but ties look much better with the Brooks Brothers shirt. Have you ever wanted a dress shirt that you could throw in the washing machine like all your other clothes? 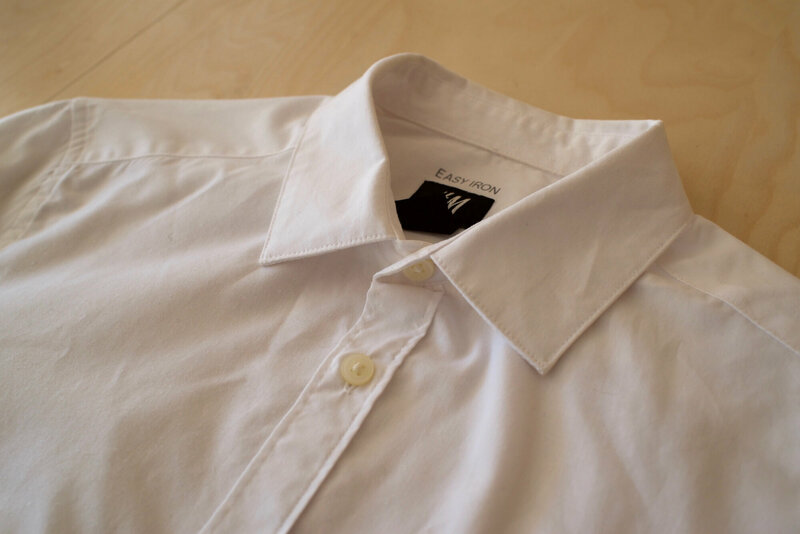 Check out our Ministry of Supply Future Forward Dress Shirt review. This shirt from Ministry of Supply is basically an athletic polyester running shirt with buttons and a collar. It feels like a t-shirt and I’ve even gone to sleep wearing it. In my opinion, it doesn’t look as sharp as a Brooks Brothers shirt, but it is much more comfortable and is easier to maintain. The buttons on both shirts are plastic. 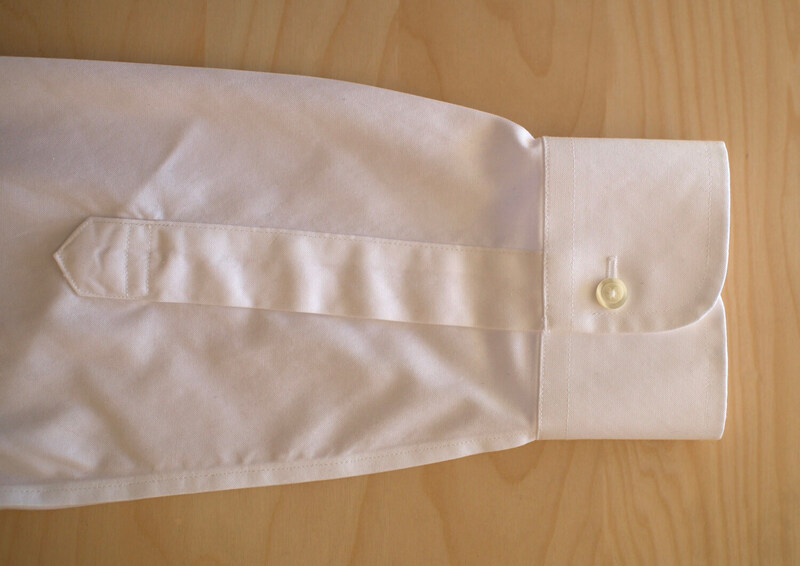 You’d expect a $92 shirt to at least have mother of pearl buttons. Both shirts are made in Asia; Brooks Brothers from Malaysia and H&M from Bangladesh. The Brooks Brothers shirt has a breast pocket, but the H&M shirt doesn’t. It doesn’t make much difference to me, as I find breast pockets to be completely useless. Pricing aside, if I had to choose between the two, I would choose the Brooks Brothers shirt – it’s far superior to the H&M shirt in every respect, as I’ve detailed in the above comparison. The H&M shirt feels more casual and had a slightly better fit (for my frame), though. The main differences between the two were the materials and collars. But which is the better value? First, let’s be real: how often do you ever wear dress shirts? It’s often the case that the expensive item in a man’s closet is the item he wears the least. The H&M shirt is good for occasional wear for a season or two, but not much more. I haven’t had my Brooks Brothers shirt for very long, but I expect for it to last much longer than the H&M shirt. If you can get the Brooks Brothers shirt on sale for less than $70, I would say that it is a better deal than the $15 H&M shirt. At the full $92 retail price, it’s slightly overpriced. What are your thoughts? Which one would you choose? Leave a comment below. Honestly, I have three of these type of H&M shirts (I just bought five more on sale for $10 each – a week’s worth for the price of one Brooks Brothers shirt that’s significantly on sale). I wear them all the time – I’d say each one at least 2-3 times a month, and I think I’ve had them for several years. I like that they’re slim-fitting, and because I don’t need to iron them (they say “easy iron,” but frankly, I haven’t noticed a need to iron at all), I turn to them more often than any of my other shirts (a mix of Express, Nordstrom, Men’s Warehouse, and others). The Brooks Brothers shirts are, of course, far higher quality, but I can’t imagine paying even $70 for a shirt, let alone $92 – particularly not a shirt for everyday work attire. I don’t even pay that much for my pants (mostly a mix of Express, Uniqlo, Gap, and H&M). Yes, there is an argument for investing in higher quality clothing that will theoretically last longer, but that’s assuming that the clothing won’t be damaged in the meantime. 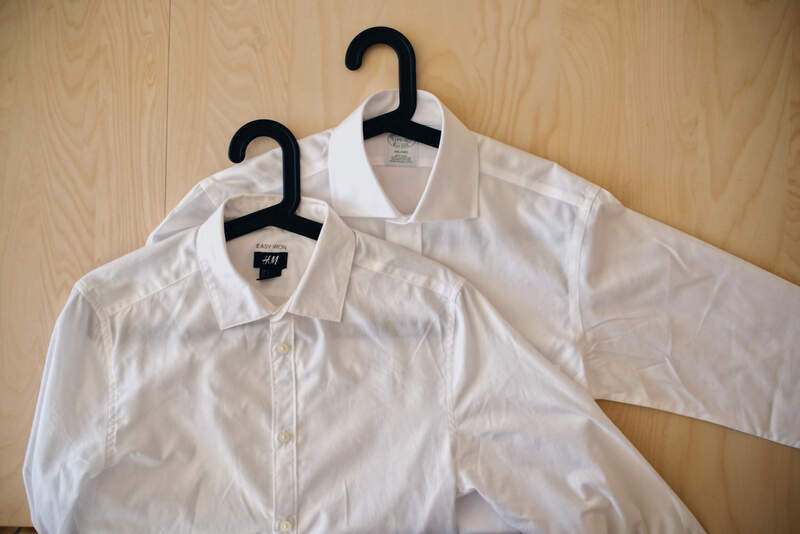 With the risk of spilling food on my shirts, sweat stains around the collars, brushing up against chalk on a restaurant’s walls (that happened to me while I was wearing one of my favorite, more expensive shirts, and it ruined it), something happening in the laundry …. I don’t trust that the shirt will last long enough to get my money’s worth out of it. And because I worry that something will happen to the shirt, I wouldn’t wear it as often, so it’d just sit there, not being worn. Admittedly, I’m just shy of thirty, and I don’t need to wear suits to work everyday. I can see how, for a person with a different life, the Brooks Brothers shirts could potentially be a better value. But in terms of “how often do you wear dress shirts?” – I wear them five days a week. I could go to New York and see Hamilton on Broadway for the price of a week’s worth of full-price Brooks Brothers shirts, so that’s rather more than “slightly overpriced,” I’d say. Anyway, I like your comparison between the two shirts; I find it informative. I just think your ending conclusion is interestingly dissimilar from what mine would be. I paid $69 for my shirt (but there’s almost always a 4 for $199 sale), and it probably wasn’t the smartest decision from a personal finance perspective, but I’m ok with it. I usually reserve the Brooks Brothers shirt for the more formal occasions, and the minute details like the crisp collar was something I was willing to take a monetary hit for. To use your example, I’m not a Broadway fan and as ridiculous as this may sound, I’d rather get a weeks worth of dress shirts than a ticket to Hamilton on Broadway, so it comes down to personal values – this was just something that I was willing to splurge on. I will admit, dress shirts are annoyingly fragile and upkeep is a nightmare – it’s something like $1.50 per shirt to dry clean at my local dry cleaner. 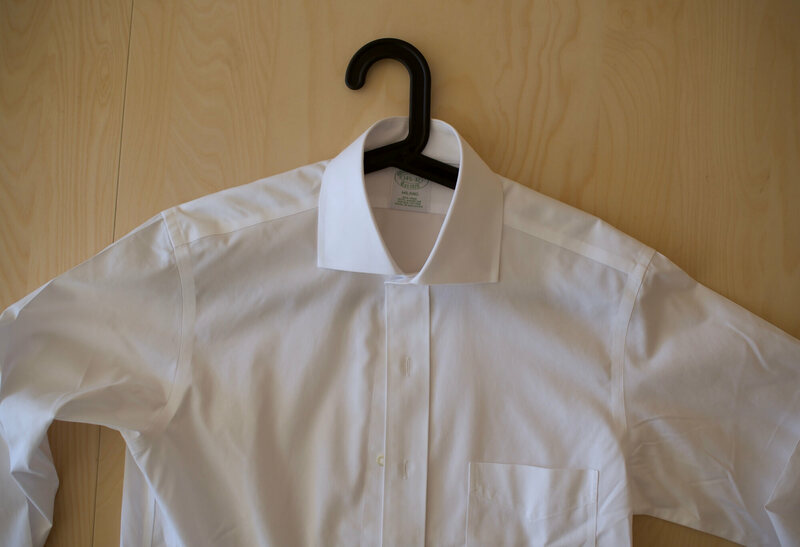 To be honest, I wear my Ministry of Supply dress shirt more often than both of those, because it’s more comfortable and I can just throw it in the washing machine if it’s dirty or stained (and it doesn’t wrinkle). One of the worst style mistakes you can commit is to show your undershirt when you wear your slim fit dress shirt unbuttoned or when the lines show underneath your dress shirt. I read your article with great interest. From the pictures in this article I think the Brooks Brothers shirt is superior if one was to judge by quality alone. I am assuming that both shirts are straight out of the package. Idid notice that the Brooks Bothers plackets and cuffs appear to be well interfaced-smooth and no bubbles. On the H&M shirt the button placket is bubbled and looks poorly done. There’s no ironing that away. On the Brooks Brothers cuff it is noticably smoother and there appears to be a small amount of gathering/easing of the sleeve into the cuff as compared to the H&M shirt with has a narrower cuff and no apparent gathers/easing into it from the sleeve. To me the presence of that easing/gathers indicates that they are allowing for a roomier fit and less binding at the wrist. As to pilling of the H&M shirt fabric that could be due to the tendency of a multiple fiber type (poly and cotton blend) where the weaker fabic (cotton) releases loose fibers and the polyester holds those loose fibers (pills) in place making for a less than attractive appearance. As to the Brooks Brothers shirt poplin cotton fabric it is describes as feeling heavier and perhaps reflects a tighter weave stucture that resists pilling. Perhaps the poly/cotton blend is not as tight a weave structure and has not been treated with polymers designed to lock in those loose fibers.What’s concerning, however is the wrinkle free or easy iron aspect of both shirts. This is likely due to both fabrics being treated with a formaldehyde resin to bond the surface of the fabics and resist/eliminate wrinkles. I’ll refernce a New York Times artice regarding this fabric treatment here-NYTimes.com: Formaldeyde in Wrinkle-Free Clthes May pose Skin Risks. So, another aspect of shirts/clothing that is worn a short time and discarded( due to poor condition or changing tastes) is the overwhelming problem of this clothing going into landfills. Currently H&M is sitting on a $4.3 billion pile of unsold inventory. Eileen Fisher, head of Eileen Fisher Inc, stated in 2015 when honored by Riverkeeper, “The clothing industry is the second largest polluter in the world.. second only to oil.” So what’s a guy to do when he wants a white dress shirt that looks good, the boss looks favorably on him and the girlfriend feels she doesn’t have to do a “clothing intervention” before taking him home to meet the parent AND leaves him money to go see the Rangers?